You know those awkward moments. Those times when another mom is trying to find common ground with you by bringing up a common frustration among mothers, but the ground is actually uncharted territory for you? Or similarly, those moments when you are around a mom and her kids and it becomes clear you have very different behavior expectations. One is left feeling judged for being to lax while the other one is feeling judged for being too strict. While we can find groups of parents online who share our same parenting philosophies, it can be very difficult to find one or two, much less a group, of moms who parent similarly to you within your neighborhood. That leaves us with trying to figure out how to relate with other moms when we really don’t have a whole lot in common at our base occupation in life at the moment: motherhood. We all need that like-minded mom friend to bounce ideas off of and commiserate with, but there is so much value in friends who think differently than you do! 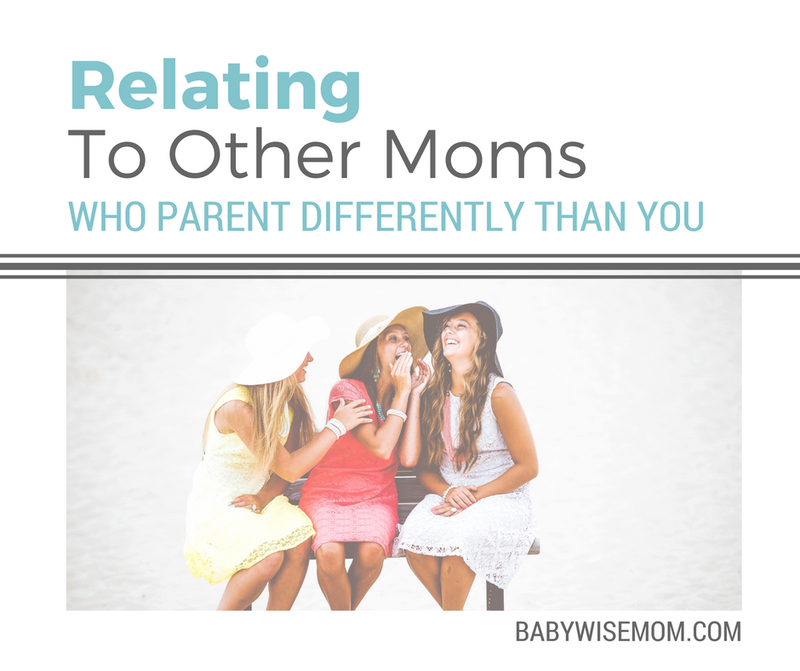 Here are some ideas for how to relate to moms even when you are vastly different. I love how Stephanie talked openly with her friend. Communication can go a long way toward understanding and connecting! “I try my hardest to be understanding of how they parent. As long as their children are healthy and behaving within the lines, I really don’t care. If their kids are out of control, I sympathize but silently say prayers of thanksgiving that they aren’t my kids 😉 Most moms are trying their best and are following what they believe. Some think I’m crazy for working so hard on a schedule. I think some are crazy for not! When we disagree face to face, I try my hardest to find common ground. From there I give my respect to the mom and bluntly say we will have to agree to disagree. With my first son, I got really rattled when my parenting was questioned. I now have confidence that I can successfully keep a child alive for three years! I love her point to lead by example. If people want what you have, they will ask. If they don’t, they won’t. I like how she pointed out to simply avoid topics that will be a source of contention. “When I see something done differently than how I choose to parent, instead of criticizing internally, I choose to focus on seeing why that style fits that parent and child/family etc. People usually have good reasons for doing things the way they do. Especially when it’s a friend, I remember that I respect them and that their family’s needs are different and that’s okay. It turns my analytical thoughts into a positive direction by using my experiences to see and know my friends better. The book the Child Whisperer has been extremely helpful in doing this. unless they ask me to. “I think in general (not even specifically in motherhood) judgement comes from a place of insecurity. If we are confident in our decisions, there really isn’t any reason to hyperanalyze how someone else does it. You don’t have to relate – you just observe and move on. On a practical level, I have learned that there is almost never a situation where it is advantageous to offer up unsolicited advice. If someone else is doing things differently – EVEN IF SHE IS TOTALLY FAILING – I generally try to hold my tongue. If she wants advice, she’ll come asking for it. Exceptions to this of course would be if a friend was doing something overtly harmful to them or their child – obviously I’d speak up at that point. So how do I respond when it’s clear our parenting philosophies are different? I DON’T. So much of what we worry about as mothers just doesn’t matter in the grand scheme of life. Yes, we have to make those decisions as parents, but the ramifications of either option often just don’t matter. Like I said earlier, you will likely not find many moms who parent exactly like you in your every day life. Sometimes those differences can cause some contention. When your child is hit by another child and the mom does nothing about it, it is hard to say, “Eh, differences don’t matter” or find common ground there. Some parenting decisions only impact that family, but others will impact your children. For the most part, however, different parenting styles aren’t going to impact you or your children. I once shared with you many of my friends. I shared how we are different and how are the same. I have some mom friends who are basically the same as I am as a parent. These are definitely special friendships and we get along so well with each others kids and our kids get along well with each other. But that doesn’t mean I don’t value my friendships with my mom friends who parent differently. One of my very favorite friends lets her kids sleep in bed with her and sugar runs freely at her house. Those are just a couple of differences. I could let those things divide us and stay away, but then I would be missing out on a great friend. I have found things in common with her. She demands her kids be respectful of people and she is pretty crazy on car seat standards just like I am. We both have our four year olds in five-point harnesses while most people around here have four year olds bouncing around in the car…We have differences as moms, but that doesn’t threaten either of us. We are more than “just” moms. Yes, motherhood is a huge part of our lives and a huge part of what defines us, but it isn’t the only thing. My friend I was just talking about has more in common with me than our mom connections. We are both organized and OCD in many ways. We both have PCOS and connect over that struggle. We have a lot of similarities in life, but just as many differences. I have learned so much from her about enjoying life and living in the moment. You can connect over differences just as much as you can similarities. Even when you find that mom who is your clone, you will have differences. They might be silly differences. My clone loves sushi and I want to gag just thinking about it. She hates verbal confrontation and it doesn’t make me bat an eye. 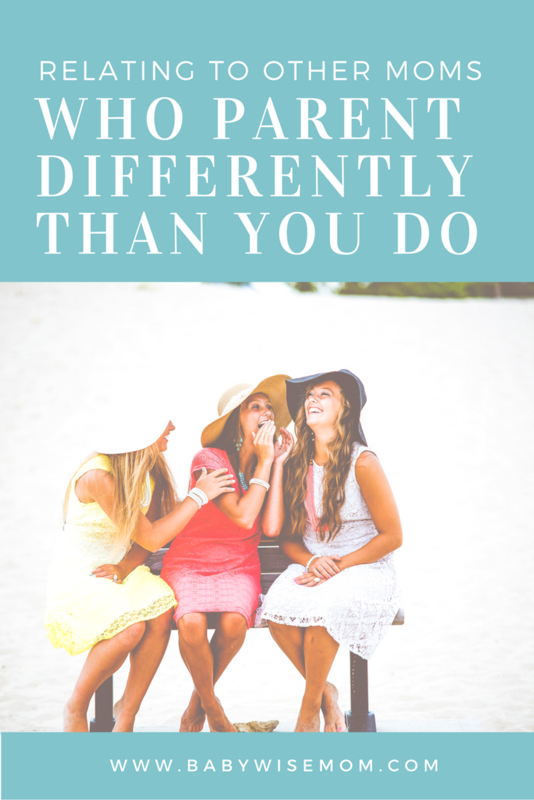 The point is, even someone who has similar life experiences and parenting styles as you will be different from you in ways. If you look for people just like yourself, you will be left with only yourself as a friend. You have to accept the differences. I think a great secret among my friends is that our differences are not an elephant in the room. We openly discuss how we are different and no one worries about it. We usually laugh our heads off about the differences. Pretending the differences aren’t there gets awkward over time. There is no authenticity. You have to be accepting of differences. When my husband and I had been married for a year and a half, we moved into a new town. The wife next door visited with me. She had 8 kids and I had 1, so obviously we had some blatant differences before us. She asked me what I liked to do. I told her my short list, and she responded, “Oh, all of the things I hate.” And that was that. She decided then and there that we were too different to be friends. The trick to discussing differences is to remove judgement from the conversation. Find what is the same, find what is different, and love your friends through it all. Look at differences as a way to learn new things and see the world from a different view. You need friends in your life. Open yourself up to them. Do not let the differences stifle your relationships. Sure, you won’t be best friends with everyone you meet. You don’t have to be. But you can grow great friendships even with people vastly different from yourself. If you want to get to know other people better and grow closer to them, you need to spend time with them. You can do this by meeting at the park to visit while your kids play. You can have moms over to your house with their kiddos to visit while kids play. You can meet up at a local jump park, splash pad, or even McDonald’s. Meeting with kids is fun, but the best is getting together without kids. Organize Girl’s Night Out each month. My friends and I do this. We take turns hosting and we do it after kids are in bed. We have so much fun. Sometimes we just talk (and eat treats). Sometimes we go out for dinner or dessert. Sometimes we sit around the camp fire. Sometimes we go to an amusement park. It gives much needed girl talk and we get to know each other without being interrupted every five minutes (at best). You can also go out on date nights with your spouses. We are living in a climate where too many people are willing to throw away even old friendships over differences of opinion. Those differences enrich our lives and help us see the world in a more-rounded way. It is okay to be different from other friends, and definitely okay to make friends who are different. Find common ground where you can, agree to disagree where you need to, and have fun together!